This is highly compatible non-ECC RAM - single 4GB DDR2 dimms are relatively rare. Highly skilled hardware technicians. Form factor: SODIMM 200-pin. Technology: DDR2 SDRAM. Capacity: 2GB. Fit: Laptop notebook. RAM features: Unbuffered. Form factor: SODIMM 200-pin. Technology: DDR2 SDRAM. Capacity: 2GB. 1080P VGA to HDMI Converter Audio USB Cable Adapter For Laptop PC DVD HD TV UK. Fit: Laptop notebook. RAM features: Unbuffered. Bluetooth Keyboard Tablet Cover Case Stand for Samsung Galaxy Tab A6 T580 T585. Desktop RAM. Compatible with multiple systems. Gaming PC take a little bit longer usually is dispatched after 48h. Second user products may show normal signs of use - scratches, scuff marks, dusty etc. 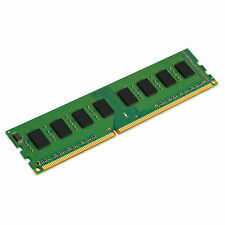 Spec: DDR2 PC2-5300 667MHz 200-pin SODIMM Pins: 200-pin, Gold Connectors. 2GB DDR2 667MHz PC2-5300S 200PIN SO-DIMM Laptop RAM. Device: Laptop Bus Speed: 667MHz (PC2-5300). 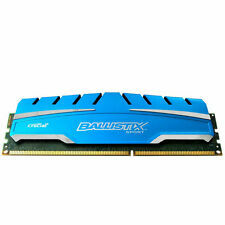 TYPE: DDR2 RAM (2Rx8). CAPACITY: 2GB (1 x 2GB). 2 x 2gb Kingston DDR2 667mhz Dimm (4GB Total). This is highly compatible non-ECC RAM. Improves air flow and handy for PC's tight on space. Highly skilled hardware technicians. We always showactual pictures which is for atypical item so you have a clear idea of what you're getting and avoid any surprises. SPEED: 667MHz PC2-5300. 1GB ( 1 X 1GB). TYPE: DDR2. CAPACITY: 1GB PER MODULE. TYPE: FOR LAPTOP. Will send in an anti static bag and padded envelope for protection. 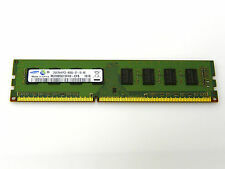 • DDR2 • 4 x 240-pin DIMMs • 667MHz • PC2-5300U • Unbuffered • non-ECC •. DIMMs manufactured by Samsung and Crucial, two matched pairs. Type: DDR2 SODIMM. Speed: PC2-5300 667MHz. 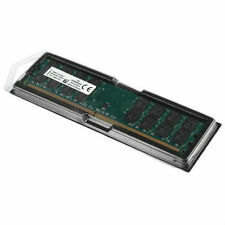 2GB 2RX8 DDR2 667MHz PC2-5300S 200PIN SO-DIMM Laptop RAM x 2 pieces. Frequency: PC2-5300S 667MHz. Orders will be processed instantly and dispatched in 24 hours normally, so we do NOT accept any requested note before or after you place orders. Tested using onboard diagnostics of a Dell Optiplex 760. Condition is Used. Pulled from working PCs that have been upgraded, then tested. Your iMac has two ram slots and the maximum upgrade is 6GB (2GB 4GB) . IMAC DETAILS. IMAC Identifier. INSIDE YOUR IMAC. Core 2 Duo. Module Capacity: 2GB. Module Capacity: 4GB. Early 2008. Hypertec HYMDL8216G 16GB DIMM PC2-5300 Dell Equivalent Memory Kit Registered ECC for Dell PowerEdge 2970, M605, M805, M905, R300, R805, R905, T605 As new, never used. Surplus to requirements after large estate upgrade. (667MHZ 240Pin. 1 x 667MHZ 240Pin. Type: DDR2 for the AMD only to AMD SDRAM / special conditions) DRAM. Capacity: 2GB. Form Factor: DIMM 240-pin. Fully tested Special conditions of ADM.
2GB 2RX8 DDR2 667MHz PC2-5300S 200PIN SO-DIMM Laptop RAM x 2 pieces. Frequency: PC2-5300S 667MHz. Alternatively, complete repurposed modules may be sourced. A Hypertec Legacy Sun equivalent 16GB kit x 2 FB DIMM (PC2-5300) from Hypertec. Audio Visual. you can buy in set of 6 max. we do not take any responsibilty after this. Alternatively, complete repurposed modules may be sourced. Audio Visual. we do not take any responsibilty after this. Monitor & TV. Component for PC/server. Desktop PC. you can buy in set of 6 max.